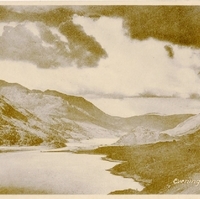 A postcard depicting a view of Loch Levan, located in Kinross, Scotland. The loch is the largest natural shallow body of water in lowland Britain. It is home to more breeding ducks than anywhere else in inland Europe. Originally published by Miller and Lang, Ltd.
"Loch Leven." Scotland's National Nature Reserves. http://www.nnr-scotland.org.uk/loch-leven/. “Evening Loch Leven Postcard.” RICHES of Central Florida accessed April 22, 2019, https://richesmi.cah.ucf.edu/omeka/items/show/6655.